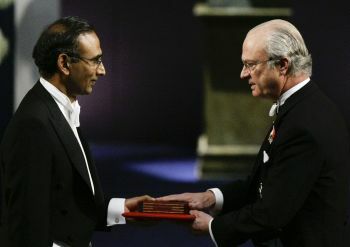 Indian-American Venkatraman Ramakrishnan received the 2009 Nobel Prize in Chemistry at the Concert Hall in Stockholm on Thursday. Sweden's King Carl XVI Gustaf presented the highest honour in the field of Science to Dr Venkatraman. The prize consists of a medal, personal diploma, and a cash award. 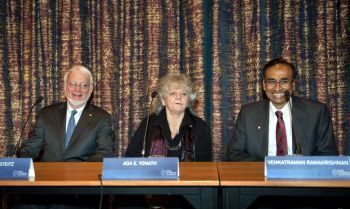 Dr Ramakrishnan had won the Prize along with American Thomas Steitz and Israel's Ada Yonath for their pioneering work on the ribosomes, which may help develop new medicines in decreasing the sufferings of the humanity. 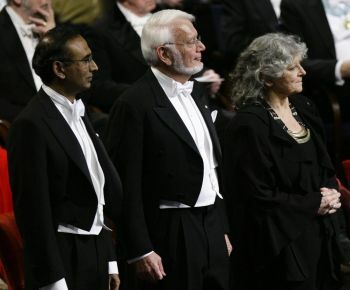 The Royal Swedish Academy of Sciences, while announcing the winners, had said that the three scientists' work on ribosomes has been fundamental to the scientific understanding of life and has helped researchers develop antibiotics. This year's three laureates, who will share $1.4 million award, generated three-dimensional models that show how different antibiotics bind to ribosomes. "These models are now used by scientists in order to develop new antibiotics, directly assisting the saving of lives and decreasing humanity's suffering," the academy had said in its citation. Fifty-seven-year-old Ramakrishnan, is the senior scientist and group leader at the Structural Studies Division of the MRC Laboratory of Molecular Biology in Cambridge, England. Steitz, a 69-year-old, is a professor of molecular biophysics and biochemistry at Yale University. Yonath is a professor of structural biology at the Weizmann Institute of Science in Rehovot, Israel, and the ninth Israeli to win a Nobel Prize.